In his new book, Saving Truth-Finding Meaning & Clarity in a Post-Truth World, author and speaker Abdu Murray will most certainly help to answer this question and bring clarity to his readers as he explains just how this ‘post-truth’ era came about and how it has brought us into a Culture of Confusion which is detached from reality and awash in feelings, preferences and relativism. 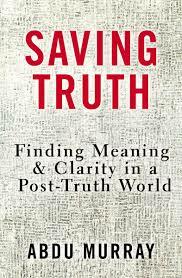 “Unlike postmodernism, the post-truth mindset acknowledges objective truth, but subordinates it to preferences. That’s dangerous, as logic and evidence don’t have the same influence over the post-truth mindset that they had over a postmodern. In a post-truth age, if the evidence fits our preferences and opinions, then all is well and good. If it doesn’t, then the evidence is deemed inadmissible or offensive, with offense being a kind of solvent against otherwise sound arguments. To mix metaphors a bit, the post-truth mindset is like bacteria that have mutated to become immune to antibiotics. Where truth and logic could combat postmodern bacteria, they seem powerless to arrest post-truths’ infectiousness. So why do so many people, including Christians, misapply Jesus’ statements as a blanket prohibition against all judgment? There are as many reasons as there are people who do so. One common reason is that Christians want to appear tolerant and likable, especially in a time when tolerance, though woefully misdefined–is a chief virtue. Put plainly, many Christians have bought into what Kinnaman and Lyons call “the new moral code” that people should not criticize someone else’s life choices. Can we see the seduction playing out right before our eyes? The post-truth Culture of Confusion elevates preferences and feeling over facts and truth… Dallas Willard’s apt assessment of the spiritual landscape, in which “most of what Americans do in their religion now is done at the behest of feelings… The quest for pleasure takes over the house of God.” Willard’s indictment is true for some of us all of the time. And it is true for all of us at least some of the time. The second seduction–that of using the truths of Scripture to bludgeon outsiders–brings a pendular swing of over-correcting our desire to be liked. Too often, Christians conveniently forget the fact that like everyone else, they need a Savior. When Christians forget that, they create an “us versus them” paradigm, leading to Christians hungrily gobbling up and passing along iffy articles about how awful “they” are without a moment’s pause. Worse yet, Christians may make churches so unwelcoming that they repel the very people who could benefit from what Jesus has to offer. Truth is once again sacrificed, but this time at the altar of a self-righteous higher agenda to stand up to “them.” Fair or not, people judge the credibility of a message by the integrity of the messenger. If the gospel message of compassion, forgiveness, and reconciliation is proclaimed by those who seem to have none of those qualities, it’s hard to see how the broader culture’s response can be anything but concomitant dismay and anger. Jesus is the river and the land, the fount of living water and the rock of our salvation. He secures humanity’s freedom to be what we were intended to be: sacred beings in relationship with the divine. When we realize that, confusion dissipates like a fog and clarity remains. What is truth? we may ask in a world that elevates personal preference over truth. The answer is Jesus–the truth who is personal. He is the Saving Truth.